I recently spotted the Tandoor Chef Naan Pizzas in the grocery store and thought, 'They beat me too it!' I've been wanting to make my own version of a Naan pizza after spotting a recipe online, but decided to give Tandoor Chef's Spinach and Paneer Cheese Naan Pizza a try first. The frozen box hung out in my freezer for a little while until one afternoon I had a strong desire/craving to try out my next Pizza Eggs concoction: a fried egg atop a pizza. All I had in the house was the Naan pizza, so it was going to have to do. 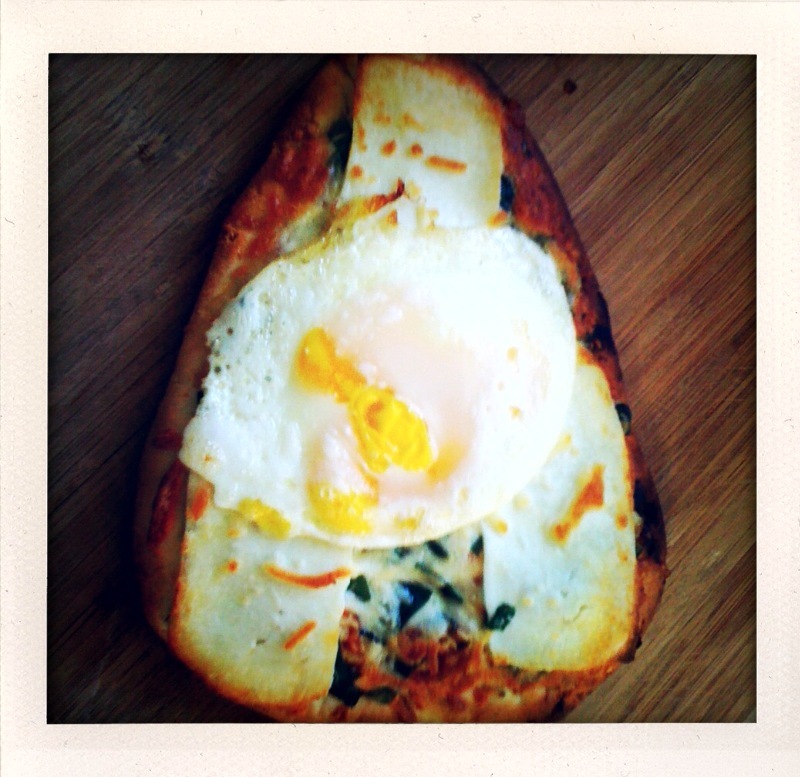 Despite my complaints , the experience of eating an egg atop a pizza was delightful. It mixed well with the cheese, spinach and tomato sauce, and it made for a very filling Sunday brunch. If you are using a frozen pizza, follow the directions on the box and begin baking the pizza in the oven. Once the pizza is in the oven, heat cooking oil in a frying pan over med-high heat. Crack and fry egg in the frying pan (break the yolk!) for 1-2 minutes, or until the egg can be picked up with a spatula without being too runny. Try to time it so that you are finished with the half cooked egg approximately halfway through the pizza baking process. At this time, open up the oven and place the partially fried egg on top of your pizza. The egg will fully bake while the pizza completes baking. If you are using fresh pizza dough or naan, then you can actually just crack the egg on top of your pizza before baking. Just make sure you have a high crust, or toppings surrounding the edge of the pizza sufficiently so that the egg doesn't run off the side while baking. A third option would be to bake the pizza and then ad the completely fried egg on top at the end of the cooking process. When finished from whatever method you prefer, remove the pizza from the oven and devour.